Katherine (Kat) Crispin works underground in the sunless depths of the Millennium Science Complex’s vibration-isolated basement laboratories. This underground life may not be as difficult for Kat as for some of her Materials Characterization Lab colleagues, because Kat voluntarily spends much of her free time underground, as a passionate cave explorer. She is also the administrative vice president for the National Speleological Society, and is heavily involved in cave conservation and cave education. 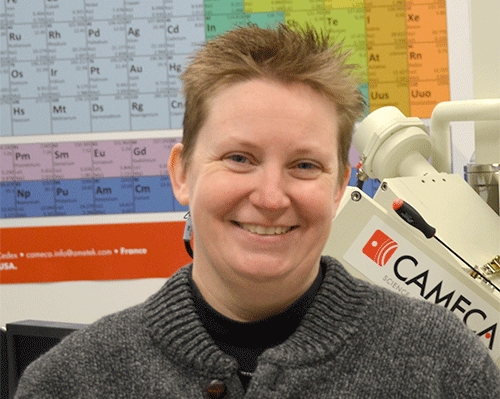 Kat is an expert on the electron microprobe, or electron probe micro analyzer (EPMA), an instrument that is widely used by both geoscientists and materials scientists. “The electron microprobe is similar to an SEM in that we have a column with electrons coming down and interacting with a sample. But the EPMA is not primarily an imaging instrument; rather, our goal is to get chemical data,” she explains. The electron microprobe has five spectrometers that are tuned to a particular angle. When the electrons hit the surface of the sample, they generate characteristic X-rays based on the type of elements they bounce off of. The instrument creates a map of the elements and gives the concentration of elements down to a few hundred parts per million resolution. “I’m mapping where the elements are in the sample. When it’s done, it looks like an electron image, but it’s not. It’s quantitative data as to the distribution of elements in a material,” she says. The EPMA technique was originally created by materials scientists and was primarily used in materials science, for instance to look at steels and other alloys. Gradually it came to be an important tool for geoscientists, who use it to map the mineral distribution and diffusion rate in rock samples. Kat’s goal in coming to Penn State and joining the Materials Characterization Laboratory was to bring this important technique back to the material sciences. Kat came to Penn State about a year and a half ago from the Carnegie Institute of Washington in Washington, D.C. Her Ph.D. is from Case Western Reserve, and she also has a background in law enforcement. In fact, she was in her thirties, working the night shift at a company that was facing technological obsolescence when she vowed to return to school and get her first science degree ( in addition to others she already had), in chemistry. Then she went on to get her Ph.D., in geology. For more information about the electron probe micro analyzer, contact Katherine Crispin, Ph.D., at klcrispin@psu.edu, 814 865-0344.